I just found my forever home and a girlfriend,too! 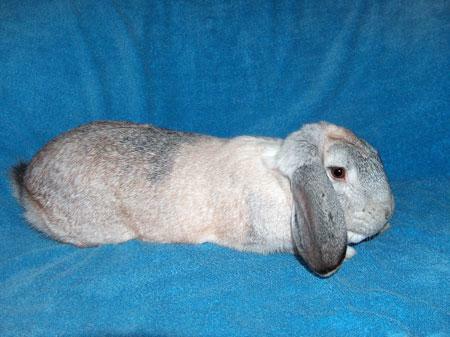 Dudley just came back from several months in a foster home where he was a free roaming bunny. His foster parents are traveling throughout the summer and could no longer foster this big, goofy guy. We are hopeful that Dudley can find a home soon, because he will surely get depressed and cranky having to go back into a smaller set-up as we have limited space here at our foster center. if you are interested in adopted a big bunny with a big personality, who sometimes thinks that he is a dog, please meet Dudley soon. He's a gorgeous bunny with LOTS of energy and love to share. NOTE: Dudley is truly an amazing rabbit. He's handsome, fun and goofy. He is getting depressed and we are eager to find him a fabulous home where he can be an integral part of the family with mostly cage-free time. You will love him! Please meet him soon! Hey! My name is Dudley. I am a very charming and engaging big, neutered bunny boy. I LOVE being with people and getting a LOT of attention. You can pet me for hours. Actually, I get a bit annoyed when you stop petting me! I am super social and outgoing and a fun-loving guy. I am a favorite of some of the volunteers here at SaveABunny with my friendliness and big fat bunny head and muscular bunny body. I'm a hoot! I run over to the front of my pen to meet you and quickly settle in for kisses,love and pets from you. I'm a very fun and engaging boy and will make you laugh smile and be glad you adopted me.